If you have a hunting cabin, you may have experienced some of the issues that can plague them. Whether it’s cabin invaders (either 2 or 4 legged), rotting wood, or a leaky roof, conventional cabins can require a lot of maintenance and care. If you’re thinking about building your dream hunting cabin, you might want to consider using a shipping container as a base. After all, you want to spend your time hunting or hanging out with your hunting buddies rather than repairing your cabin. And you definitely don’t want to arrive just to find that a trespasser accidentally burned down your cabin! Because a shipping container is constructed of sturdy metal and can be sealed up tight, when you arrive you’ll find your container cabin in exactly the same condition as when you left it last. Add an outhouse or composting toilet, water cistern, a camp stove, and solar power or a wind turbine and your cabin will have all of the comforts a hunter could want no matter how far out in the woods it is. To see a finished example of what your hunting cabin might be like, check out this one on YouTube. If you want a cabin large enough to accommodate a bigger hunting party, this one melds two containers into one comfortable cabin. It’s so nice inside, even the non-hunting members of your party will probably enjoy spending time there! When you’re ready to build your “contained” cabin, contact us. 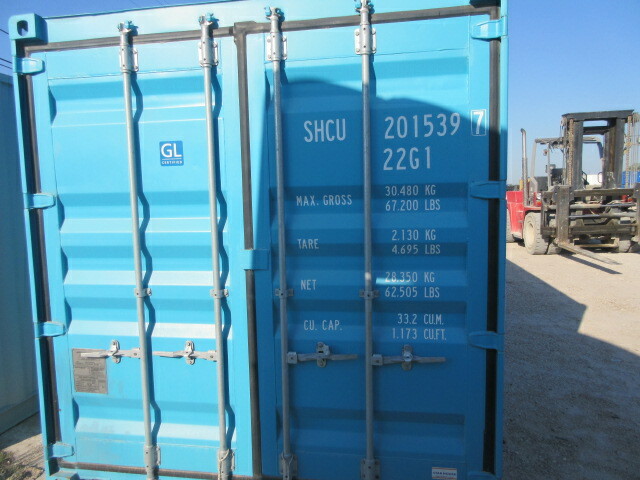 We can provide you with a container that is just right for your build. Should You Consider a “1-Trip” Shipping Container? The 1-trip shipping container is a beautiful thing in the world of shipping containers, and by beautiful we mean it’s only been used once during its journey to North America. The one trip container has actually been used for one cargo load, hence the name, but for all intents and purposes, it is new. The question is, does new matter? Here are three things to consider when choosing a new or used shipping container? How long do you plan on using the shipping container? The average used shipping container for sale is around 8-14 years old. If your needs are short term, such as just a few months or years, a used container will probably suit your needs just fine. If you’re looking for a container for the long term a new container may be more practical. A new container without receiving any maintenance will last for 10 years. With proper maintenance and care, they can last another 20 years beyond that. Of course, this also means a well-cared for used container could potentially last for 20 or more years as well. A new 1-trip container has fresh paint and is remarkably clean inside and out. For some companies, this makes a difference, for others it makes no difference at all. Consider what the container will be used for and how important the looks are. If you are storing scrap material or used tires, how fresh the paint looks is probably not a priority. How specific must your containers be? For some companies, container specification is crucial. They rely on each containers being identical. They require the same manufacturer, the same wall thickness, and the exact same color. This is extremely difficult to achieve with used containers. If specifics are vital, it may be time to consider 1-trip containers. Contact us today to begin your search for the perfect storage container. Our dedication and attention to detail ensures you receive the highest quality container every time.